The broadening of the image to the dimensions of binocular vision should fatally transform the internal sensibility of the filmgoer. In what respect? The stretched-out frontality becomes almost circular; in other words, the ideal space of the great dramaturgies. Up until now, the look of the spectator has been that of someone lying prone and buried, walled up in the darkness, receiving cinematic nourishment rather like the way a patient is fed intravenously. Here the position is totally different: I am on an enormous balcony, I move effortlessly within the field's range, I freely pick out what interests me, in a word I begin to be surrounded, and my larval state is replaced by the euphoria of an equal amount of circulation between the spectacle and my body. 1. Roland Barthes, ‘On CinemaScope’, in Jonathan Rosenbaum, Placing Movies: The Practice of Film Criticism (Berkeley: University of California Press, 1995), p. 101. Why does a widescreen format that, five years after its initial launch in 1953, appeared to be generally out of favour, still evoke an intense fascination among film scholars and cinephiles? Not only did CinemaScope have a short life; many distinguished filmmakers also infamously rejected the anamorphic widescreen system with its impressive aspect ratio of 2.35:1. Despite the sophisticated staging strategies that some of them developed in Scope, the format is at least equally known for the technical restrictions it implied, and, above all, the aesthetic possibilities these restrictions eliminated. As director Henry Koster recollected, looking at the first rushes of The Robe (the first picture released in CinemaScope in 1953), half of the shots showed actors out of focus. (2) Since the camera lens and its anamorphic attachment had to be focussed separately, keeping all the actors largely in the same (distant) plane proved to be the best solution. 2. David Bordwell, Poetics of Cinema ( London: Routledge, 2007), p. 291. Moreover, early Scope lenses gathered significantly less light, and therefore offered a very limited depth of field. Actors and objects appeared at their sharpest when filmed from far back, so directors were advised to put the camera no closer than seven feet. 3. Todd McCarthy, Howard Hawks: The Grey Fox of Hollywood (New York: Grove Press, 1997), p. 532. 4. Bordwell, Poetics of Cinema, p. 302. While early Scope films often display enforced applications of the frame-within-the-frame, directors like George Cukor, Vincente Minnelli or Elia Kazan would later figure out virtuoso staging patterns in order to highlight parts of the large field. But directors could also audaciously choose not to stress essential parts of the composition. Observant viewers could then discover these crucial, but only subtly incorporated, details autonomously. These unemphasised details are only visible for the active – and, in this sense, cinephile – viewer, who must employ a panoramic perception in order to discover them. A much-discussed shot in which a film director bluntly uses the full potential of the CinemaScope frame to construct a meaningful composition appears in Nicholas Ray’s Bigger Than Life (1956). But there is more to it. Later in the film, the bottle of cortisone pills will become of crucial importance, when Ed develops an addiction, and subsequently undergoes a mental metamorphosis. The planimetric composition in the hospital is therefore a cornerstone of the narrative; yet Ray resists the urge to take his audience by the hand, refusing to explicitly forecast the disastrous consequences of the cortisone. In the entire scene, he never visually emphasises the bottle; instead of cutting to a closer shot, he even bans it to the far edge of the wide frame, leaving it there solely for the attentive viewer to notice. 5. Heinrich Wölfflin, Principles of Art History: The Problem of the Development of Style in Later Art (New York: Dover Publications, 1950), p. 120; David Bordwell, ‘Shot-consciousness’, David Bordwell’s Website on Cinema: Observations on Film Art, 16 January 2007. While CinemaScope’s restricted depth of field pushed filmmakers towards lateral staging, André Bazin and his disciples at Cahiers du cinéma lyrically welcomed the particular mise en scène that the widescreen format cultivated. Godard, Truffaut, Rivette and company signalled that the enlarged playing space eliminated the need for montage, ‘in which’, according to Bazin in 1954, ‘people have wanted wrongly to see the essence of cinema’. (6) Instead, Scope stimulated filmmakers to base their mise en scène on refined staging patterns and elaborate plan-séquences. In his championing of ‘directors who put their faith in reality’ and respect the medium’s specific ontology, instead of imposing via montage a superficial meaning on reality, Bazin had previously applauded the deep focus composition, in which the spectator, just as in real life, could autonomously and phenomenologically interpret the ambiguously captured reality. (7) But even more than deep focus, CinemaScope seemed to herald, for Bazin, the ‘end of montage’, in favour of objective images spread across the broad frame. It thus shaped the conditions for viewers to develop a cinephile spectatorial attitude, epitomised by simultaneous immersion and participation. Éric Rohmer admitted that he liked to be ‘enveloped in the spectacle’, and this was exactly what CinemaScope offered. (8) But, as Christian Keathley pointed out, ‘an increased image also increased the visual freedom they had before the film image’. (9) A comparison between the shot from Bigger Than Life and film history’s most iconic deep focus composition illustrates this increased visual freedom. When staging Susan Alexander’s suicide in Citizen Kane (1941), Orson Welles and Gregg Toland made use of a baroque, deep focus shot to spread a complete storyline across three planes in focus. 6. André Bazin, ‘The End of Montage’, The Velvet Light Trap, no. 21 (1985), p. 14. 7. Bazin, ‘The Evolution of Film Language’, in What is Cinema? (Montréal: Caboose, 2009). 8. Éric Rohmer, ‘The Cardinal Virtues of CinemaScope’, in J. Hillier (ed. ), Cahiers du cinéma: The 1950s: Neo-Realism, Hollywood, New Wave (Cambridge, Massachusetts: Harvard University Press, 1985), p. 280. 9. Christian Keathley, Cinephilia and History, or The Wind in The Trees ( Bloomington and Indianapolis: Indiana University Press, 2006), p. 46. One could argue that the cortisone shot presents a very similar action, but this time spread across the horizontal axis. 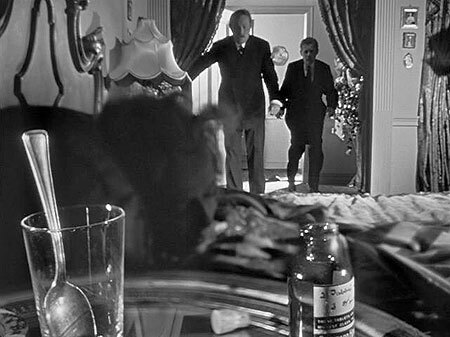 While Welles positions the fatal medicine on a large foreground, such that it is impossible for us to misinterpret the meaning of the shot, Ray dares to leave the pills unemphasised at the far corner. He thus displays a monumental trust in the intelligence of the cinephile spectator, whom he believes is able to scan the whole frame autonomously, discover the bottle, and consequently derive conclusions from it. Another director who counted on the ability of the audience to scan the panoramic frame is Anthony Mann – not coincidentally also a favourite of the Cahiers editors. In the 1950s, Mann directed four Westerns in CinemaScope, all of them bearing his stylistic signature. Mann consistently challenges spectators to examine the vast sceneries of the New Mexican and Californian valleys accurately. A scene from The Man from Laramie (1955) brightly demonstrates his strategy. When Will Lockhart (James Stewart) meets his companion Charley O’Leary (Wallace Ford) in the rocky Santa Fe landscape, Charley suddenly notices something off screen, and informs Will that somebody is following him. Instead of showing a close shot, revealing the identity of the pursuer, Mann then cuts to a panoramic long shot of the landscape. In this shot, the alert viewer might, seemingly from the men’s point of view, notice how a horse rider evanescently disappears behind a hill in the far distance, accompanied by Charley’s voice: ‘He’s keeping out of sight’. Out of sight for the passive spectator, at any rate. Once familiar with Mann’s methods, the cinephile observer remains continuously on guard, since every long shot might contain crucial information. Mann even self-consciously plays with this effect, by occasionally including eyeline matches of deserted landscapes, in which the audience then fruitlessly browses for important details. The panoramic shot is evidently a key component of the Western’s iconography, but Mann uses it for specifically cinephilic purposes. In the final scene of Man of the West (1958), he cleverly employs the Scope frame to play a game of visibility. At the conclusion, Link Jones (Gary Cooper) awaits the train robbers Claude (John Dehner) and Ponch (Robert J. Wilke) in the ghost town of Lassoo. The attentive audience witnesses their arrival, once again staged by Mann in distant depth, before Link does. During the shoot-out that follows, Mann incorporates numerous long shots, constantly rewarding the active viewer with more information than the characters receive. Otto Preminger used this staging pattern even more ingeniously. In Bonjour Tristesse (1958), he frequently plays with the visibility of his characters in and around their summerhouse on the French Riviera. A first example appears early in the film: staged in front of the pool house, Raymond (David Niven), his daughter Cecile (Jean Seberg) and his summer love Elsa (Mylène Demongeot) are discussing Raymond’s romances when, suddenly, an anonymous young man fleetingly passes by in the lower right corner of the frame. 10. André Bazin, ‘Beauty of a Western’, in J. Hillier (ed. ), Cahiers du cinéma: The 1950s, p. 167. This discovery, once again facilitated by the proportions of the CinemaScope frame, pricked me – as Barthes would say – for, until then, Preminger had not shown him. The following shots, however, further reveal the identity of the enigmatic young man. In the subsequent shot, Cecile’s glance is attracted by something off screen; abruptly she leaves the conversation. The long shot that ensues, after a shot of the peering faces of the surprised Raymond and Elsa, shows Cecile jumping into the Mediterranean, apparently heading for a floating sailboat. The following, closer shot reveals that she is trying to save the capsized Philippe (Geoffrey Horne), a law student with whom she will have an affair. However, the attentive spectator, who has already scanned the previous frames cautiously, is at that point already aware of Philippe’s presence. Like Mann, Preminger often challenges his audience to cultivate a panoramic perception mode. Time and again, he hands them elusive cues, hinting at where and for what they should search in the CinemaScope frame. Bonjour Tristesse contains two remarkable instances of this tactic. The first one takes place during a night out in town. When Cecile and Philippe enter the scene, situated at a very crowded piazza, they look for Elsa, Raymond, and his new love interest, fashion designer Anne (Deborah Kerr). Framed in a long shot, Cecile suddenly calls for Anne, but Preminger refuses to cut to a closer shot. We thus have to explore the frame autonomously, eventually discovering them in the far distance of the packed composition, where Raymond raises his hand. While Raymond and Anne then make their way forward through the mass, the wandering look of the cinephile spectator focuses on Elsa who, while the conversation on the foreground progresses, keeps dancing with a certain Pierre; as meticulously choreographed by Preminger in a single take, Elsa only joins the others when she becomes the subject of the conversation. A strikingly similar scene occurs just before the film’s finale. Cecile meets up with Philippe at his parents’ house, where Elsa is supposed to be waiting for her, in order to develop a plan to eliminate Anne. While the young lovers enthusiastically embrace, Cecile asks Philippe three times where Anne is. In the meantime, the active spectator, at that point already familiar with Preminger’s sophisticated staging methods, notices a shallow pink silhouette in the far background, out of focus because of the limitations of the anamorphic format – conveniently applied by Preminger in order to evoke a sense of mystery. A similar long shot from another Preminger film in Scope, River of No Return (1954), became the topic of a 1963 text on widescreen mise en scène by Charles Barr, and an enlightening response by David Bordwell in 1985. In the shot, which came to be known as the raft scene, farmer Matt (Robert Mitchum) saves newlyweds Harry (Rory Calhoun) and Kay (Marilyn Monroe) from capsizing. When Harry lifts Kay off the raft, she accidentally drops her suitcase, which drifts off screen to the right. Despite the symbolic weight of the suitcase, Preminger patiently lets the action unfold itself, and allows the observant spectator to notice the floating suitcase twice more in the background of the same plan-séquence. 11. Charles Barr, ‘CinemaScope: Before and After’, Film Quarterly, Vol. 16 No. 4 (1963), p. 18. 12. Rohmer, ‘Cardinal Virtues’, p. 281. 13. Barr, ‘CinemaScope: Before and After’, p. 19. For Bazin, it [CinemaScope] extends cinema’s ability to reveal aspects of phenomenal reality. For the mise en scène critics of Cahiers, the new format enhances Hollywood’s expressive resources while still respecting canonised principles of style, especially the primacy of the profilmic event. (14) 14. Bordwell, ‘Widescreen Aesthetics and Mise en Scène Criticism’, The Velvet Light Trap, no. 21 (1985), p. 20. 15. Bazin, ‘The Evolution of Film Language’. The film is not so much an end as a means. Its unpredictability attracts him, the chance discoveries that mean things cannot go according to plan, on-the-spot improvisation that is born of a fortunate moment and dedicated to the fleeting essence of a place or person. (16) 16. Jacques Rivette, ‘The Essential’, in Cahiers du cinéma: The 1950s, p. 134. The most gifted Scope directors did indeed create the conditions for reality to unfold itself in a way that was often not choreographed for us to see. One of my favourite moments in Nicholas Ray’s Rebel Without a Cause (1955) comes early on – in a scene that Barr not coincidentally praised for its pictorial qualities and subtle camera movement. (17) On the morning of his first day at Dawson High, Jim Stark (James Dean) nervously peers through the window. Suddenly his attention is attracted by the appearance of Judy (Natalie Wood), the enigmatic girl he saw the night before at the police office. He approaches her and, as they walk, the camera moves laterally with them. ‘I’ve seen you before’, he tries. ‘Well, stop the world’, she answers. ‘You don’t have to be unfriendly’. And then it happens. ‘Well, that’s true’, Judy responds, while she nonchalantly passes her cigarette with her left hand to her right hand, and, only half smoked, drops it, and brings her right hand to her forehead: ‘But life is crushing in on me’. While the (by definition) highly subjective, cinephiliac moment might therefore arise in every film, the above-mentioned epiphanic discoveries in CinemaScope indicate that the format not only modified the frame, but also the conditions of cinephile viewing. 18. Rohmer, ‘ Ajax or the Cid?’, in Cahiers du cinéma: The 1950s, p. 111. 19. Paul Willemen and Noel King, ‘Through the Glass Darkly: Cinephilia Reconsidered’, in Willemen, Looks and Frictions: Essays in Cultural Studies and Film Theory (Bloomington & Indianapolis: Indiana University Press, 1994), p. 234. 22. Keathley, Cinephilia and History, p. 32. © Sam Roggen and LOLA August 2013.